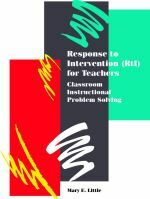 Response to Intervention (RtI) for Teachers: Classroom Instructional Problem Solving is an interactive, practical resource for teachers and other educators. RtI for Teachers reveals how to actively participate in the problem-solving instructional process. It provides a step-by-step approach to classroom instructional problem solving (action research), including descriptions of each phase, reflection activities, planning forms, and concrete, real-life examples. Through its practical, teacher-focused process approach based on current research, legislation, and policies, RtI for Teachers offers evidence-based resources in both instruction and assessments for use in classrooms and schools.